CH ICAGO — The national organization for evaluating and recognizing excellence in political messaging and organizing — The Peer Choice Awards Organization — has presented American Strategies CEO Thomas Mannix with an annual “Goldie” award and statuettes for his work in direct mail political advertising. 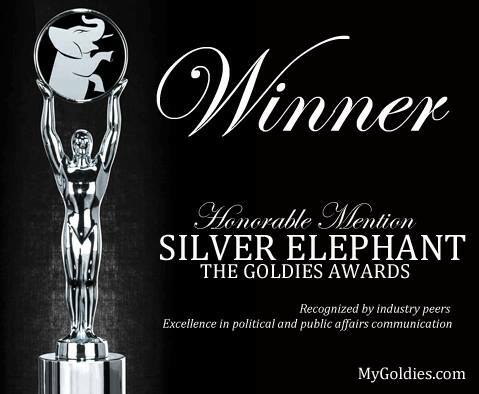 Goldies are awarded each year following the evaluation of nationwide submissions to Peer Choice of the best political advertising products disseminated through television, radio, direct mail, paid print media, telecommunication, and through campaign websites. Additional categories awarded recognition are fundraising and social media campaigns. “It is very rewarding for us to be recognized by a nationwide panel of our peers, many of whom are our competitors in the national and regional political spheres. Our team is honored to be selected for this award and we hope to live up to the national standards of the Peer Choice panelists by continuing to produce the highest quality political advertising,” said Mannix.